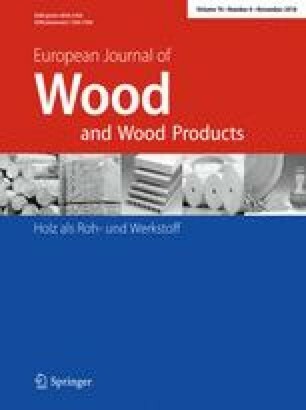 This research investigated the long-term environmental effects on bond strength at the interface between fiber- reinforced polymers (FRPs) and timber. A total of 581 timber specimens were bonded with seven types of FRP sheets (unidirectional and bidirectional glass, carbon, aramid, and hybrids) using a wet lay-up technique. The specimens were exposed to acidic, alkaline, fresh water, and sea water solutions with pH of 2.5, 7, 7.25, 10, and 12.5 for 1, 3, 6, 9, and 12 months. A chamber was also used to simulate ultraviolet radiation after 6 months. A series of single-lap shear tests were then conducted to determine the interfacial bond strength reduction. The results showed that bidirectional carbon and glass FRP sheets demonstrated better bond strength as compared to unidirectional carbon and glass FRP sheets in most cases after exposure to the chemical solutions and ultraviolet radiation. Moreover, acidic and sea water solutions, respectively, had the most and the least effects on the reduction of bonds at the interface between hybrid FRPs and timber. Meanwhile, bidirectional aramid FRPs showed high deterioration in the interfacial bond strength under the effect of water and alkaline (pH 12.5) solutions. Finally, the failure modes on timber substrates were explored and classified.